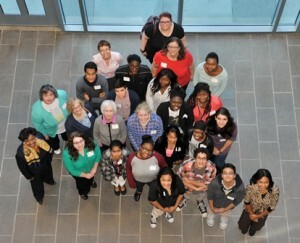 On November 2, we gathered at the Yonkers Public Library to honor 21 very special kids who participated in the 2013 Teen Learning Ambassadors Program. It was hard not to be moved by the Learning Ambassador celebration. Parents shared stories about how excited their kids were to go to work each day. Many called their coordinator Francine Vernon – the brains behind this initiative – the next day to offer their thanks for having made such a significant investment in their children. As Francine just noted to me, the kids had likely not shared with their parents what they were doing day-to-day, so this was a chance for them to be dazzled. In truth, the parents absolutely glowed. The teens, initially a bit tongue-tied during the interview, warmed to their subject. Then the librarian mentors added their perspectives, which were a mix of pride in their teen ambassadors and delight in what they accomplished. To learn more about the WLS Learning Ambassadors Program, and how you can support it, click here. Want to make aspirations a reality? Dialog, Listen, Act. MEDICARE CHOICES – Open Enrollment is the time to make them and change them!